1. This 5m white LED light strip is made up of 10pcs of 50cm led light strip.The color temperature can be 2700k, 3500k, 4000k, 5000k, 6500k and other color temperatures you would like. 2. 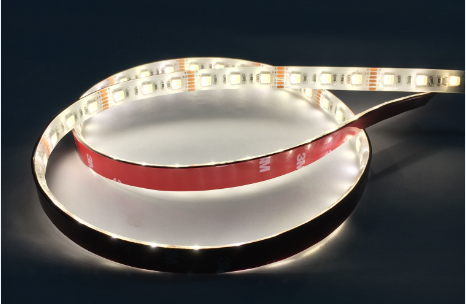 Compared to other strips in the market, our LED Light strip uses 4 ounce copper intead of 2 so it takes higher current. This makes the strip more durable and it increases the lifespan. 3. You may be concerned that the LED Light strip you buy will have dark spots very soon. Most of the time, dark spots are caused by 2 reasons. 1 reason is having leds going out, another one is resistors getting loose and cause unconnectedness between circuit and resistors. We only use top quality leds which rarely go out. The solder paste we use is Japanese brand SENJU which only top companies use it. The solder points from this solder paste have resilience so solder points don't get loose, especially during hot and cold temperature. 4. The solder paste we use is lead-free. In the market, most of the LED Light strip exported from China use solder paste with lead in it. The reason is that lead solder paste has stronger adhesiveness. For flexible PCB, to use lead-free solder paste increases the risk of having high failure rate. If you want to have high quality products, you have to use top brand solder paste, of course it is much more expensive. That is why a lot of suppliers utilize solder paste with lead. We all know lead is harmful to people, especially to kids. 5. The LED Light strip is completely coated so it is water resistant and it can be used outdoors.